Zuba's father left his job as a University Professor and decided to open a school. He employed a school principal, who together with her husband, a retired military were wolves in sheep's clothing. They dragged him to his deathbed. Due to his delicate health, his son was obliged to take over the management of the school. Zuba, as the new head of school decided to sack the principal when he discovered her malicious intentions. However, he found himself sinking in a quagmire. Firstly, she threatened him and demanded for a huge amount of money that she did not deserve. Upon Zuba's refusal, they made up a story whereby he was eventually accused of robbery and theft. Consequently, he was arrested and taken into custody by the police. This novel mainly narrates Zuba's plight in prison. How he found himself trapped in his country's legal system rife with corruption. Where Guilty or Not Guilty was a matter of "how-much-are-you-ready-to-bribe-the-police?" The whole novel was mostly about Zuba vainly trying to put the record straight in order to leave the prison. "The Shadow of a Smile" was well written and an easy read, you know it is not the type you annoyingly come across grammatical errors every now and then. I liked it. Some of the settings were in my home town Ogidi and the characters were Igbos like me. Everything sounded so familiar. However, it was not a novel I thoroughly enjoyed. I had the feeling it lacked somethings that could have made it more enjoyable and interesting, you know the type that keeps you hunger looking forward for more; hence the three stars. All the same, it was a good read. Finally, I recommend, especially if you would like to find out what it feels like to be in a prison in Nigeria. 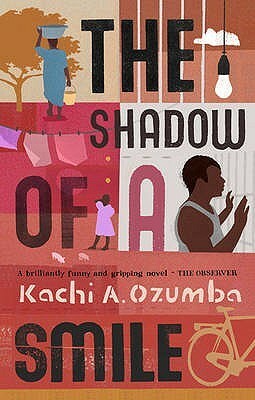 Kachi A. Ozumba is a Nigerian writer, winner of the Commonwealth Short Story Prize (Africa) 2009. This is his first novel. In my opinion he is quite promising and I would not hesitate to read more of his works in the future. The premise sounds interesting. I think the injustice of Zuba's story would make me even more angry at the imbalance in the system. Yes, absolutely I feel you. More often than not, I too was angry. interesting,I will definitely read it. Interesting review. Quite worrisome and for the principal and her husband to connive to destroy a family in such a manner but it does happen. And I feel such indignation at the injustice of it all. Yeah. .. the worst part of it all is that stories like this take place more often than not. There are people who would go too far in destroying other people's peace.